It sounds more far-fetched than anything a film-maker could invent - the story of how a director and a leading actress were kidnapped by North Korea and forced to make films for the state's movie-mad leader, Kim Jong-il. It seemed like a simple solution - North Korea needed skills. Other countries had those skills - so why not just just kidnap the skilled workers? In some cases, very skilled workers. In 1977, a top South Korean pianist was hired by a mysterious patron to give a private performance in an isolated villa outside Zagreb. But he'd grown suspicious, spotting a North Korean aircraft at the airport and then hearing North Korean accents as he approached the house. He fled and escaped. But South Korea's most celebrated film director and his film-star wife were not so lucky. Shin Sang-ok and Choi Eun-hee were both snatched in Hong Kong. A similar ruse was used to that tried with the pianist - the lure of meeting in a remote house. The couple spent eight years in North Korea making films there before finally escaping. The kidnap plot was hatched by Kim Jong-il who, before he succeeded his father as the country's leader, was in charge of its film industry. He was a great film buff, an avid watcher of Hollywood movies - in particular, the first Rambo movie, anything with Elizabeth Taylor and the James Bond films which may have fed his appetite for covert operations. North Korean diplomats in Western countries were instructed to secure copies of blockbusters for him to watch in Pyongyang. But Kim Jong-il wanted something more. He was desperate for the North Korean movie industry to compete on the international stage. He wanted to be the producer of films that won trophies at the world's great cinema festivals. The answer was obvious - at least to him: kidnap South Korea's most famous film-making couple and compel them to create movies to wow the world. It was a modus operandi straight out of the 007 manual from the Bond movies that Kim Jong-il loved. The actress Choi Eun-hee was snatched first. In 1977, her career in decline, she was approached by someone posing as a Hong Kong businessman with a proposal to form a film-making company which would revive her fortunes - monetary if not on-screen. The kind of money movie people dream of would be available and she would be reborn as an actress-turned-director. According to a new book, A Kim Jong-il Production, she was persuaded to go to Hong Kong and then on to a meeting on one of the islands. On the way, the car stopped on Repulse Bay and she and the accompanying agent of the North Korean state (for so it proved to be) got out. There was a group of men near a motor boat and Choi Eun-hee was grabbed and sedated. As the book puts it: "She drifted in and out of darkness. She remembered feeling someone carrying her up a gangway, someone giving her an injection, then oblivion swallowed her back up. When she finally woke, she was aboard a freighter in the captain's cabin. A large ceremonial portrait of Kim Il-sung smiled down at her." Eight days later she was in Pyongyang in a luxurious villa that was constantly guarded. Despite being divorced, Shin Sang-ok and his ex-wife had remained close and he went to Hong Kong to look for her. He too was abducted. "Someone suddenly pulled a sack over my head and I couldn't see anything or breathe properly," he said later. At times the two were held separately and Shin Sang-ok spent four years in prison when he resisted pressure to co-operate. The two were reunited when he finally relented. Later, some argued that their stories didn't add up and that they had defected when their careers in the south declined. But Paul Fischer, the author of A Kim Jong-il Production, says he is convinced they resisted and then, once broken, became reluctant collaborators with the regime in Pyongyang. "It took five years in North Korea to get them to the point where they started working and by that time film-making was a lifeline for them. 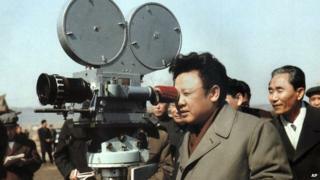 They both found Kim Jong-il to be a fairly knowledgeable film producer. Shin Sang-ok, the South Korean film-maker, when he sat down and had production meetings with him would find someone who was able to talk to him about a variety of films," he says. They worked together and produced a series of films for North Korea. Perhaps the most notable was one that became something of a cult classic - a socialist monster movie, Pulgasari, in which the monster sides with peasants against a feudal landlord. "A film with an untidy plot cannot grip the audience and define their emotional response"
"No production of high ideological and artistic value can evolve out of a creative group whose members are not united ideologically and in which discipline and order have not been established"
After eight years the couple tricked Kim Jong-il. They won his trust and were allowed to travel to Vienna where they fled. They sought sanctuary in the United States embassy and were debriefed by the CIA. He died in 2006 and she still lives in Seoul. Though they asserted that they were captives, they still used to apologise to Kim Jong-il for having deceived him - perhaps a type of Stockholm Syndrome where the captive identifies with the captor. North Korea denied the two were abducted saying they had sought sanctuary there. They had one important piece of evidence in their favour though - a recording they made secretly of Kim Jong-il. And North Korea has admitted abducting some Japanese citizens - Tokyo and Pyongyang held talks over the matter last year. North Korea acknowledged that it kidnapped 13 people in the 70s and 80s. Five of them were returned to Japan in 2002 but Pyongyang says the other eight died, though Japan doesn't believe this. Prof Andre Lankov of Kookmin University in South Korea reckons that nearly 500 South Koreans have been abducted. "The vast majority of them are fishermen who were imprudent to come too close to the North Korean coast but this figure also includes a number of known victims of covert operations," he says. "A good example is the case of the five South Korean high-school students who disappeared from beaches in 1977 and 1978. They were believed dead for two decades but in the late 1990s it was discovered that they were working in North Korea as instructors, teaching the basics of the South Korean lifestyle to would-be undercover Northern operatives." He says abductees, who were often teenagers, were used as language teachers and even trained spies. "Simple approach: you have problems with teaching foreign languages, you kidnap a native speaker. You have problems with movies, you kidnap a producer and director." A simple approach - if you like the show, steal the show-maker. North Korea's leaders are often thought of as ruthless, secretive autocrats but rarely as popular children's authors. However, between issuing instructions about prison camps and the development of nuclear weapons, Kim Jong-un's father and grandfather apparently found time to write stories for the young.